This article is about the current NHL franchise. For the previous NHL franchise with the same name, see Winnipeg Jets (1972–96). For the former Western Hockey League team, see Winnipeg Monarchs (WHL). The Jets began play as the Atlanta Thrashers in the 1999–2000 NHL season. True North Sports & Entertainment then bought the team in May 2011 and relocated the franchise from Atlanta to Winnipeg prior to the 2011–12 season (the first NHL franchise to relocate since the Hartford Whalers became the Carolina Hurricanes in 1997). The team was renamed the Jets after Winnipeg's original WHA/NHL team, which relocated after the 1995–96 season to become the Arizona Coyotes. On December 27, 1971, Winnipeg was granted one of the founding franchises in the World Hockey Association (WHA). By 1979, the vast majority of the WHA's teams had folded, but the Jets were still going strong and they were absorbed into the NHL along with the Quebec Nordiques, Edmonton Oilers and Hartford Whalers as part of the WHA–NHL merger. Team owner Barry Shenkarow sold the team to American businessmen Steven Gluckstern and Richard Burke. Burke and Gluckstern originally planned to move the team to Minnesota (which had lost the North Stars to Dallas in 1993), but eventually reached an agreement with Phoenix businessman Jerry Colangelo that would see the team move to Arizona and become the Phoenix Coyotes. The original Winnipeg Jets played their last game on April 28, 1996. In their 12 years, the Thrashers qualified for the Stanley Cup playoffs only once, during the 2006–07 season, and never won a playoff game. Partially due to their lack of playoff success, the team had difficulty drawing fans to attend their games in their final seasons. Although they moved for financial reasons, the Coyotes have never been profitable in Arizona. Mounting losses eventually compelled the franchise to file for bankruptcy after the 2008-09 season. The team was taken over by the league before the next season began. As early as October 2009, there were rumours that True North Sports & Entertainment, the company that owns both Winnipeg's Bell MTS Place (then known as MTS Centre) and the American Hockey League (AHL)'s Manitoba Moose and is chaired by Mark Chipman, had been invited to bid on the city's former franchise. TNSE submitted a series of bids for the Coyotes, which were taken seriously enough that the league drew up a tentative schedule with Winnipeg in place of Phoenix. The NHL shelved the bid after securing a large subsidy from the Coyotes' municipal government. In contrast to aggressive, public bids by Jim Balsillie (who had unsuccessfully attempted to use bankruptcy laws to skirt NHL rules and move the Coyotes to Hamilton), True North's low-key approach was praised by NHL commissioner Gary Bettman and other owners, raising their profile when the question of the Thrashers' relocation came up. Crowds gather at The Forks in Winnipeg on May 31, 2011, for the official announcement that the Atlanta Thrashers would relocate to Winnipeg pending the approval of the NHL's Board of Governors. On May 20, 2011, the Winnipeg Sun confirmed that an agreement in principle had been reached for True North to purchase the Thrashers, while Winnipeg Mayor Sam Katz announced that he was confident that the Thrashers' relocation to Winnipeg would soon be officially announced. On May 31, 2011, at a press conference at the MTS Centre, Bettman confirmed that the Atlanta Thrashers had been sold to True North and would relocate to Winnipeg for the 2011–12 season, pending the approval of the sale and relocation by the NHL's Board of Governors, which came at their June 21, 2011, meeting. The reported purchase price was $170 million, with $60 million going to the NHL as a relocation fee. After the announcement, True North made preparations to move the Moose franchise to St. John's, Newfoundland and Labrador. Season ticket sales began June 1, 2011, with Manitoba Moose season ticket holders having priority. The team sought to sell 13,000 season tickets in an effort to prove its viability. Within the first three and a half hours, the new franchise sold 1,870 packages to Moose season ticket holders. Season tickets opened to the general public on June 4 and sold out in 17 minutes. Once the "Drive to 13,000" was completed, True North started a season ticket waiting list, which was shut down after 8,000 people signed up in two hours. In July 2011, tickets for October 9 home opener against the Montreal Canadiens were listed for an average price of $1,711 on Stubhub, with an average selling price of $713. True North said the team's name would not be announced until after the successful completion of the season ticket drive at the earliest. The team was not to be named the Thrashers, since True North did not acquire the name in the transaction, and the rights to that name and the Thrashers logo were retained by the ownership group in Atlanta. There was considerable support in Winnipeg to reuse "Winnipeg Jets", the name of the city's original WHA and NHL franchise, though rumours spread that True North preferred "Manitoba Moose". "Whiteout" and "Falcons" were also considered, but the latter was quickly rejected in deference to Atlanta, which has another professional sports team by that name. True North kept their selection secret until the 2011 NHL Entry Draft in St. Paul, Minnesota, on June 24, when Chipman introduced General Manager Kevin Cheveldayoff to "make our first pick, on behalf of the Winnipeg Jets." Before the franchise relocation was officially completed, True North bought out the remaining years of General Manager Rick Dudley's contract on June 4, 2011. Thrashers President Don Waddell, who had been with the franchise since its inception, had earlier announced he would not be moving with the team. Kevin Cheveldayoff, a former GM of the Chicago Wolves and former assistant GM of the Chicago Blackhawks, was hired to replace Dudley four days later. The team also retained Marcel Comeau, the director of amateur scouting. On June 12, 2011, Cheveldayoff had Thrashers Head Coach Craig Ramsay reinterview for his position, then formally dismissed him as head coach eight days later. Claude Noel, who had been the head coach of the Manitoba Moose, was named head coach four days later; the other finalist for the job had been Chicago Blackhawks Assistant Coach Mike Haviland. Charlie Huddy, Pascal Vincent and Wade Flaherty, formerly of the Dallas Stars and Blackhawks, were named Noel's assistant coaches. The team celebrate their first regulation win as the Jets at the MTS Centre on October 17, 2011. The Jets made their formal regular season debut on October 9, 2011, when a sellout crowd at the MTS Centre saw the visiting Montreal Canadiens defeat the Jets 5–1, with Nik Antropov scoring the first-ever Jets goal. This debut featured a concert by Bachman–Turner Overdrive where Randy Bachman sang "We Just Got Back The Jets" in place of the title refrain of "You Ain't Seen Nothing Yet". Other highlights on the first Jets schedule included a home-and-home set with the Phoenix Coyotes, Winnipeg's previous NHL franchise (including a December 1 game in Winnipeg, the Coyotes' first regular season appearance in Winnipeg since vacating the city), as well as a December 17 home game against the Anaheim Ducks, which was former Jet Teemu Selänne's first playing appearance in Winnipeg since being traded from the Jets in February 1996. During the summer of 2012, the Jets added Perry Pearn to their coaching staff. They also named former Thrasher Assistant General Manager Larry Simmons as assistant general manager. As the Jets inherited the Thrashers' position in the Southeast Division since the 2011–12 season, the NHL and National Hockey League Players' Association (NHLPA) were prompted to consider realignment of teams. Beginning in 2013–14, the Jets moved to the Western Conference and play in the new-look, seven-team Central Division. The Jets fired Noel and Pearn in January 2014, with the former being replaced by veteran coach Paul Maurice. On April 9, 2015, the Jets clinched their first Stanley Cup playoff appearance since relocating to Winnipeg following a 1–0 shootout loss to the Colorado Avalanche. They clinched the spot after the Calgary Flames defeated the Los Angeles Kings later in the night. Finishing the season in the second wild card spot, they played the top-seeded Anaheim Ducks in the first round. In the first playoff series that involved a team from Winnipeg since the 1996 playoffs, the Ducks swept the Jets in four games. Dustin Byfuglien with the Jets in the 2015–16 season. The Jets signed Byfuglien to a five-year extension in the 2015 off-season. The season following their first playoff run was a disappointment, as the Jets finished 25th overall, well out of the playoffs. 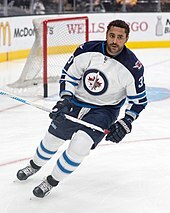 Management was forced to deal with expiring contracts of two star players, electing to sign Dustin Byfuglien to a five-year extension while trading team captain Andrew Ladd to the Chicago Blackhawks at the NHL trade deadline. Despite finishing with the sixth worst record in the league, the Jets managed to win the second overall pick in the 2016 NHL Entry Draft through the draft lottery, which they used to select Finnish prospect Patrik Laine. Later that summer, the team appointed Blake Wheeler as their new captain. In the 2017–18 season, the Jets clinched their second playoff spot since relocating from Atlanta. On March 25, 2018, the Jets beat the Nashville Predators 5–4 in a shootout, and clinched a spot in the 2018 Stanley Cup playoffs. On April 11, 2018, the Jets won the first playoff game in the history of the Atlanta/Winnipeg franchise when they defeated the Minnesota Wild 3–2. On April 20, 2018, the Jets won their first playoff series in franchise history (and the first series victory in 31 years for the city) with a 5–0 victory over the Minnesota Wild in game 5 of the First Round series, winning the series 4–1. On May 10, 2018, the Jets made further franchise history by advancing to the Western Conference Finals for the first time, defeating the Nashville Predators 4 games to 3; Nashville were the defending holders of the Campbell Bowl Trophy from the previous season and holders of the President's Trophy for most points in the league during the 2017-18 NHL season. This would also mark the first time that either iteration of the Winnipeg Jets had advanced beyond the second round of the playoffs. Facing the Vegas Golden Knights in the Western Conference Finals, the Jets defeated the Golden Knights in the first game of the series 4–2. However, the Jets went on to lose the Western Conference Finals, with the Golden Knights defeating the Jets in the following four games in the series. Patch worn during the 2011–12 season, the team's inaugural season in Winnipeg. No new logo and colours for the Jets accompanied the team's nickname announcement at the 2011 NHL Entry Draft (draft pick Mark Scheifele was presented with a generic black and silver NHL jersey and cap), but True North confirmed that they were in the process of conceiving a logo and colour scheme for the Jets, with True North's chairman, Mark Chipman, stating that the previous Jets' blue and red colours would be incorporated. 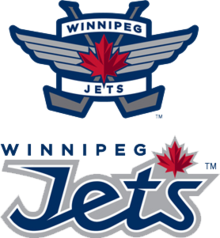 The Jets unveiled their new logos and colours on July 22, 2011, three days before the team had scheduled to release them (this after team merchandise containers were broken into and a crude picture of a Jets' T-shirt made the rounds on the internet). While blue and silver are the main colour palette, the insignias are a dramatic departure from the previous Jets' logos and pay homage to the Royal Canadian Air Force (RCAF), particularly Winnipeg's 17 Wing; the primary logo is patterned after the roundels used by the RCAF and includes a silhouette of a McDonnell Douglas CF-18 Hornet. 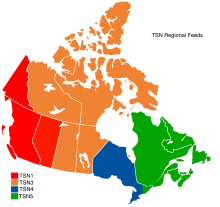 (Red is a secondary part of the colour scheme due to a maple leaf, the incorporation of which came with the permission of the Toronto Maple Leafs.) Game uniforms for the new Jets were unveiled in September at 17 Wing; the team did not introduce a third jersey for its inaugural season due to a limited timetable. The Jets kept their existing uniforms when Adidas took over production of NHL uniforms in 2017. Prior to the 2018–19 season, the Jets introduced their first alternate uniform, featuring aviator blue as the base colour, along with a new "Jets" wordmark, block letters and numbers, and striping inspired from the 1990–96 uniforms of the original Jets. The Jets also wore throwback white uniforms based on the 1973–1978 design worn by the original Jets. The uniforms made its debut in the 2016 Heritage Classic and has been used during Jets Hall of Fame induction nights since. The logo was designed by Reebok, the NHL and designer Linda Lynch. Reebok's lead uniform and team identity designers, Dominique Fillion and Linda Lynch, have been associated with the identity design, although True North has not revealed specific design credits. True North announced they had "recalled" their former Moose mascot, Mick E. Moose, from the AHL. Mick E. had spent the past 15 seasons with the Manitoba Moose of the International and American hockey leagues, entertaining fans at Moose games and community events. Slight modifications to the costume were made, including a new vintage leather aviator helmet. Since the start of the 2015–16 season, Mick E. Moose has served as mascot for both the Jets and the Manitoba Moose. A fan favourite, he also averages over 100 community appearances per season in Winnipeg and rural Manitoba. In the 2016 Heritage Classic, the current Jets resurrected their mascot from its original incarnation, Benny, and has since served as the team's secondary mascot. Beginning in 2011, during the singing of "O Canada", fans commonly shout the words "True North!" (in the line "The True North strong and free") to recognize True North Sports & Entertainment. Jennifer Hanson was the Jets' regular national anthem singer until 1996 and performed it again during the 2016 Heritage Classic Alumni Game. Stacey Nattrass has performed the anthems at the majority of home games since 2011. The Winnipeg Whiteout is a hockey tradition that dates back to 1987 when fans of the original Jets franchise were asked to wear white clothing to home playoff games, creating a very intimidating effect and atmosphere. It was created as a response to the "C of Red" created by fans of the Calgary Flames, whom the Jets were facing in the first round of the 1987 Stanley Cup playoffs. The Jets eliminated the Flames in six games, and fans wore white for every home playoff game thereafter. Fans coined it the "Whiteout." Fans of the former Jets AHL affiliate, the St. John's IceCaps, also continued this tradition, as did fans of the continuing franchise in Glendale, the Arizona Coyotes. It is referred to as the "Ice Cap's Whiteout" and "Coyotes Whiteout," respectively by IceCaps and Coyotes fans. The Whiteout was also used, during the Canada vs Russia Gold Medal game, at the 1999 World Junior Ice Hockey Championships, hosted by the city of Winnipeg. During the 2009 Calder Cup playoffs between the Manitoba Moose and the Hershey Bears, fans were asked to wear white for Game 6 of the Calder Cup Finals. The Winnipeg Jets resurrected this tradition when they qualified for the 2015 Stanley Cup playoffs. The tradition was also used in the 2018 Stanley Cup playoffs. Note: This list does not include captains from the Atlanta Thrashers. Note: This list does not include head coaches from the Atlanta Thrashers. The previous Winnipeg Jets organization retired the jersey numbers of two players, while their successors, the Arizona Coyotes, have retired the numbers of players who played for the former Jets as well. These numbers have not been officially retired by the current franchise. Upon relocation of the team in 2011, Evander Kane sought (and received) permission from Bobby Hull to wear number 9; the number had been retired by the previous Jets franchise. Kane had worn the number 9 during his time with the Thrashers, and the Jets organization encouraged him to keep the number. The Jets traded Kane to the Buffalo Sabres in February 2015. Andrew Copp has worn the number 9 since 2015. Number 25, retired by the original Jets in honour of Thomas Steen, was worn for a short time by Paul Stastny, a close friend of Steen's son, Alex. Stastny has chose the number partly because of Steen. Zach Redmond also wore the number during his time with the team. Bryan Little switched from number 10, which he wore in Atlanta, to number 18 out of respect for Dale Hawerchuk, who had worn number 10 with the original Jets. Number 11 has not been issued since the death of Rick Rypien prior to the 2011-12 season. The Jets wear stickers bearing the number on their helmets as part of the Project11 initiative in support of mental health awareness. Number 37 was not issued by the Atlanta/Winnipeg franchise between 2003 and 2016 following the death of player Dan Snyder in 2003. Goaltender Connor Hellebuyck has worn the number since 2016, having received the blessing of the Snyder family. The organization created Winnipeg Jets Hall of Fame in 2016 to honour the impact and accomplishments of the team's hockey legends and celebrate the rich history of professional hockey in the city. The inaugural inductees were the "HOT Line" consisting of Anders Hedberg, Bobby Hull and Ulf Nilsson, who were inducted on October 19, 2016. Dale Hawerchuk was honoured on November 14, 2017. Lars-Erik Sjoberg and Ab McDonald were inducted on February 26, 2019. Both were captains of the team at key points of the original team's history, with the latter being the first-ever captain for the team and the former being the first captain for the team upon joining the NHL. These are the top-ten point, goal, and assist scorers in franchise history. Figures are updated after each completed NHL regular season. These records include those accrued during the team's time as the Atlanta Thrashers. 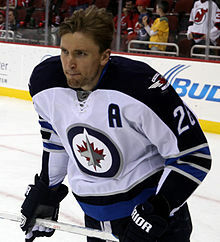 Recording 323 assists as a member of the Jets, Blake Wheeler is the franchise's all-time assist leader. The Winnipeg Jets broadcast area in orange and blue. Bell Media holds regional television and radio rights to the Winnipeg Jets, under a 10-year contract that began in the inaugural season (2011–12). Jets games not shown by the league's national broadcast partner, Rogers Media, are televised by The Sports Network (TSN) on its regional channel TSN3 for viewers in the Jets' home region, which includes Manitoba, Saskatchewan, Nunavut, the Northwest Territories (shared with the Calgary Flames and Edmonton Oilers outside of Manitoba), and parts of Northwestern Ontario (shared with the Toronto Maple Leafs). Viewers outside of the Jets' home region can view regional TSN3 broadcasts through a paid subscription for out-of-market games from the NHL or one of its broadcast partners. Dennis Beyak serves as the primary play-by-play voice for the Jets, calling games on TSN3. He is joined by either Kevin Sawyer or Ray Ferraro, who provide the colour commentary, and rinkside reporter Sara Orlesky. TSN3 colour commentary duties were formerly handled by Shane Hnidy, who moved to AT&T SportsNet Rocky Mountain to cover the Vegas Golden Knights in 2017. Radio broadcasts are carried by local sports talk station TSN Radio 1290 (CFRW). Paul Edmonds handles radio play-by-play duties radio alongside Brian Munz. They are occasionally joined by Beyak, who takes over radio play-by-play when TSN3 is not involved in the television broadcast. Munz also substitutes for Beyak on TSN3 when the latter is away on other assignments. ^ a b "Winnipeg Jets unveil Home & Away Jerseys". WinnipegJets.com. NHL Enterprises, L.P. September 6, 2011. Retrieved September 29, 2017. ^ "Winnipeg Jets Brand Identity". WinnipegJets.com. NHL Enterprises, L.P. July 22, 2011. Retrieved January 28, 2016. ^ "2011-2018 Winnipeg Jets–Greatest NHL Uniforms". GreatestNHLUniforms.com. NHL Enterprises, L.P. Retrieved May 13, 2018. ^ "TNSE Front Office". National Hockey League. Retrieved September 29, 2017. ^ Condor, Bob (May 31, 2011). "Winnipeg group has deal to buy, move Thrashers". National Hockey League. Retrieved May 13, 2018. ^ Ira Podell (June 21, 2011). "Winnipeg bound: NHL owners give green light for Atlanta Thrashers to move". Winnipeg Free Press. Retrieved June 27, 2011. ^ Bechtel, Mark (January 30, 2012). "Everybody Loves Winnipeg: Sixteen years after it abandoned North America's coldest city—and its smallest market—for sunnier, sexier climes, the NHL has returned better than ever, giving loyal fans of the reincarnated Jets, and every Canadian, something to cheer about". Sports Illustrated. Retrieved May 25, 2018. ^ O'Brien, James (November 6, 2010). "Add the Atlanta Thrashers to the list of teams facing attendance issues". NBC Sports. Retrieved May 31, 2011. ^ Ken Wiebe, SUN Media (October 4, 2009). "Thrashers to Winnipeg?". canoe.ca. Retrieved December 13, 2010. ^ "True North also had talks about buying Predators, Coyotes". National Post. June 2, 2011. Retrieved May 25, 2018. ^ Penton, Kirk (May 20, 2011). "Moose deny St. John's move". Winnipeg Sun. Retrieved May 31, 2011. ^ a b Wiebe, Ken (May 24, 2011). "NHL announcement in next few days 'realistic': Katz". Toronto Sun. Retrieved May 31, 2011. ^ "True North buys Thrashers, set to move team to Winnipeg". The Sports Network. Retrieved January 30, 2012. ^ "NHL Board of Governors approves sale of Thrashers to True North Sports & Entertainment". National Hockey League. June 21, 2011. Retrieved May 13, 2018. ^ "Pro hockey returning to St. John's". CBC News. October 6, 2011. Retrieved May 25, 2018. ^ Rush starts for NHL season tickets in WinnipegCanadian Press. Retrieved 2011-06-01. ^ "Fans commit to buying 1,870 season tickets on first day of drive". Winnipeg Free Press. June 1, 2011. ^ Tait, Ed. "NHL season tickets sell out in just 17 minutes". Winnipeg Free Press. ^ "Season ticket wait list capped at 8,000 following 17-minute sellout |Ed Tait". Winnipeg Free Press. June 4, 2011. ^ "Tickets Sold in the Winnipeg Jets Secondary Ticket Market | Illegal Curve Hockey". Illegalcurve.com. July 29, 2011. Retrieved January 30, 2012. ^ Tate, Ed (June 4, 2011). "Transition Game-True North has hands full, but not overwhelmed". Winnipeg Free Press. Retrieved June 4, 2011. ^ a b Tucker T (June 1, 2011). "Waddell's job, Thrashers name will end with sale". Atlanta Journal-Constitution. Retrieved June 4, 2011. ^ Halstead, Jason (May 25, 2011). "Thousands sign petition demanding team be called Jets". Toronto Sun. Retrieved June 22, 2011. ^ Could it be the Winnipeg Whiteout? ^ Ledra, Cristina; Pickens, Pat (November 22, 2016). "NHL team nicknames explained". National Hockey League. Retrieved May 13, 2018. ^ CBC Sports (June 4, 2011). "Thrashers GM Dudley let go by True North". CBC Sports. Retrieved May 25, 2018. ^ "CHEVELDAYOFF TAKES WINNIPEG GENERAL MANAGER'S JOB". TSN. June 8, 2011. Retrieved June 8, 2011. ^ Mirtle, James (July 14, 2011). "Jets take several Thrashers staffers with them". The Globe and Mail. Retrieved September 30, 2018. ^ "WINNIPEG GM INTENDS ON INTERVIEWING FOR COACHING JOB". TSN. Retrieved June 13, 2011. ^ Wiebe, Ken (June 20, 2011). Then there were two: Noel and Haviland still standing. Winnipeg Sun. Retrieved June 20, 2011. ^ "Noel named as Winnipeg Head Coach". Noel named as Winnipeg Head Coach. June 24, 2011. Retrieved June 24, 2011. ^ Klein, Jeff Z. (October 8, 2011). "N.H.L. : Giddy Winnipeg Reclaims Its Long-Lost Prairie Companion". The New York Times. ISSN 0362-4331. Retrieved April 13, 2017. ^ "Jets re-sign assistant coaches, add Pearn". Rogers Sportsnet. June 14, 2012. ^ "Jets promote Simmons to assistant GM". TSN. August 2, 2012. ^ "NHL's realignment plan on hold after NHLPA rejects changes". The Sports Network. January 7, 2012. Retrieved January 30, 2012. ^ "NHL players approve realignment for next season". Canadian Broadcasting Corporation. March 7, 2013. Retrieved May 25, 2018. ^ Tait, Ed (January 12, 2014). "Jets fire Noel, hire Paul Maurice". Winnipeg Free Press. ^ "Winnipeg Jets fans celebrate as team secures NHL playoff spot". CBC News. April 9, 2015. ^ "Jets move up and steal No. 2 pick for NHL Draft". Winnipeg Sun. April 30, 2016. ^ "Andrew Ladd trade with Blackhawks about development, Jets blogger says". Canadian Broadcasting Corporation. February 26, 2016. ^ "Jets clinch playoff spot after shootout win over Predators". Sportsnet.ca. March 25, 2018. Retrieved March 26, 2018. ^ Billeck, Scott (April 11, 2018). "Jets top Wild in Game 1 for first playoff win in franchise history". National Hockey League. Retrieved May 13, 2018. ^ "Jets smash Wild to win franchise's first playoff series 4-1". Sportsnet.ca. The Canadian Press. April 20, 2018. Retrieved April 21, 2018. ^ Cotsonika, Nick (May 13, 2018). "Jets feed off crowd's energy in Game 1 win against Golden Knights". National Hockey League. Retrieved May 20, 2018. ^ Hobson, Russ (May 20, 2018). "Winnipeg Jets' playoff run ends with 4th straight loss to Vegas Golden Knights". Global News. Corus Entertainment Inc. Retrieved May 20, 2018. ^ O'Malley, Dave (2013). "Roundel Round-Up - The Roundel – Part of Canadian Popular Culture". vintagewings.ca. Vintage Wings of Canada. Retrieved April 1, 2015. ^ Progress made on Winnipeg Jets logo, jerseys; no date set. The Sporting News. Retrieved July 18, 2011. ^ a b "True North Unveils Jets Logos". National Hockey League. July 22, 2011. Retrieved May 10, 2015. ^ a b c d Campbell, Tim (July 23, 2011). "Jets fly with air force logo". Winnipeg Free Press. Retrieved May 13, 2018. ^ "Jets reveal hot, new, not-so-secret Jersey design". Winnipeg Free Press. September 14, 2018. Retrieved September 15, 2018. ^ "Winnipeg Jets announce Hall of Fame inductees, Heritage jersey dates". National Hockey League. November 26, 2018. Retrieved January 2, 2019. ^ Campbell, Tim (July 22, 2011). "Winnipeg Jets unveil air force-inspired logo". Winnipeg Free Press. Retrieved May 13, 2018. ^ Williams, Patrick (September 6, 2011). "New Jets jerseys, ceremony evoke military feel". National Hockey League. Retrieved May 13, 2018. ^ "The logo its designers are ashamed of" in Fawny.org, 2011-09-13. Retrieved September 14, 2011. ^ "Mick E. Moose". National Hockey League. Retrieved May 13, 2018. ^ a b " "Fan favourite Mick E. Moose drafted into the NHL ranks". Winnipeg Free Press. October 8, 2011. Retrieved May 13, 2018. ^ Waldie, Paul (December 9, 2011). "When sports fans alter national anthems". The Globe and Mail. Retrieved April 8, 2018. ^ "Winnipeg Jets anthem singer Stacey Nattrass gets serious ice time - CBC Manitoba". Canadian Broadcasting Corporation. Retrieved May 17, 2017. ^ Sigurdson, Hal (April 18, 1987). "Whiteout aside, defence tells tale". Winnipeg Free Press. p. 83. ^ Perez, Anthony (April 11, 2012). "It's Time for WhiteOut 2012". NHL.com/Coyotes. NHL Enterprises, LP. Retrieved May 13, 2018. ^ Williams, Patrick (April 12, 2015). "Jets ready for first playoff series at MTS Centre". National Hockey League. Retrieved May 13, 2018. ^ "Winnipeg Jets Roster". NHL.com. Retrieved October 3, 2017. ^ "Winnipeg Jets Hockey Transactions". TSN.ca. Retrieved October 3, 2017. ^ Jets' Kane gets Hull’s blessing on No. 9. Winnipeg Free Press. Retrieved August 19, 2011. ^ "A Sadness in Atlanta". Sports Illustrated. October 13, 2003. Retrieved May 25, 2018. ^ Clinton, Jared (September 8, 2016). "Connor Hellebuyck switches to No. 37 with support from Dan Snyder's family". thehockeynews.com. The Hockey News. Retrieved September 28, 2016. ^ "Winnipeg Jets create Hall of Fame to honour legendary players". CBC News. July 15, 2016. Retrieved August 5, 2016. ^ Campbell, Tim (October 19, 2016). "Jets induct inaugural Hall of Fame class". National Hockey League. Retrieved May 13, 2018. ^ "Hawerchuk honored by Winnipeg, inducted into Jets Hall of Fame". National Hockey League. November 14, 2017. Retrieved May 13, 2018. ^ "Jets pay tribute to former captains Lars-Erik Sjoberg, Ab McDonald". CBC.ca. February 26, 2019. Retrieved March 4, 2019. ^ "Jets reach broadcast agreement with TSN". Winnipeg Free Press. July 21, 2011. Retrieved August 18, 2014. ^ a b "Jets game broadcasts moving to TSN3". Winnipeg Free Press. Retrieved August 18, 2014. ^ "Golden Knights name first TV, radio broadcasters". Las Vegas Sun. August 15, 2017. Retrieved August 15, 2017. 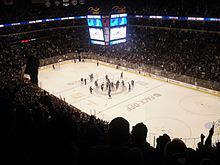 Wikimedia Commons has media related to Winnipeg Jets.